Why am I linking music and depression in the same sentence? Because music is a great depression buster. It can help us get up and do what we need to do. Let's face it, big changes like the gluten free lifestyle are hard. When it's a change that you are forced to make, like a food intolerance, rather than a choice, it can be very hard. It affects your social life, and makes it harder to travel. For a while, nothing is easy anymore. We miss the freedom to order whatever we want, choose whatever we want. Wheat actually affects the brain in ways that give us pleasure. The opioids in wheat cause an addictive, morphine type response in the brain, that gives us a feeling of comfort. It is normal to go through a period of grieving our old lifestyle and our old favorite foods, many of which contained gluten. What can lift your spirits, and help you adapt to the changes? 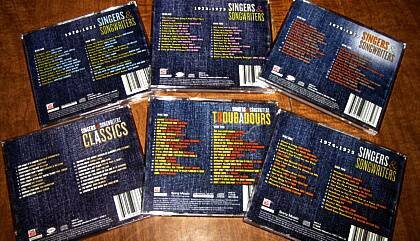 I recently came across a set of CD's from Time-Life called "Singers and Songwriters". 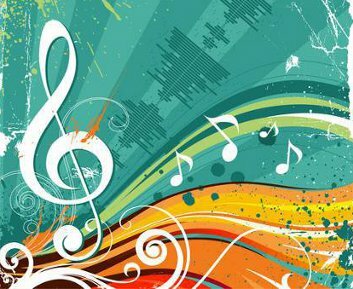 It is music from the 70's, the songs that many of us grew up with. I knew I had to get this collection, because I love about two thirds of the songs. The original songs by the original artists, in a collection of 11 cd's, or 150 songs. Including songs by Carole King, Carly Simon, Elton John, Art Garfunkel, John Denver, Eric Clapton, Linda Ronstadt, James Taylor, Janice Joplin,Roberta Flack, Paul Simon, Jim Croce, Fleetwood Mac, Seals and Croft, Hall and Oats, Jefferson Starship, The Moody Blues, Cat Stevens, The Grateful Dead, and so many more! If you recognize these names, you will love this set too. The complete list of songs is available on the Time-Life website. You will find yourself smiling, humming and then singing along. There are 2 discs in 5 of the cases shown on my table above, and one case contains one CD disc. The second CD is behind the first. You just lift the plastic form from the center outward to get to the second disc. They also have a larger set with 19 CD's, if you prefer that. For those of you who are more interested in Country Music, they have sets of country music that are comparable to this rock music collection. There is one in particular, "Country's Got Heart", in which I recognized a lot of the singers and songs too. So they were very well known and popular. There are Classical or Gospel music sets too. You can see all the different options on their site. It's hard to get so many great songs in one place. These collections are not sold in stores. So this makes a great gift for that person that already has everything, and is hard to buy gifts for. Free shipping is included automatically on this CD set. Note: I will receive a small compensation if you make a purchase, but it won't affect the cost to you. If this is not your era of music, then take a look at the 80's music. I really believe that the music that we grew up with can make a huge difference in our lives. I call it Comfort Music. It has another advantage too. It won't make you gain weight.